Engineering challenges are an engaging way to bring science concepts to life, while helping kids learn how to think creatively and critically, as well as problem solve. Kids of all ages will have fun building one of the most popular engineering STEAM (science, technology, engineering, arts and mathematics) projects—a Rube Goldberg machine! One of the best parts about this activity is that you can build your device primarily out of everyday household materials, including cardboard tubes, newspaper, cereal boxes and much more. Once you have your supplies, it’s time to start building! What elaborate and incredible machine will you build? Get your friends, family or Destination Imagination team together and show us your creative engineering skills. Share your photos and videos with us on Facebook, Twitter and Instagram. 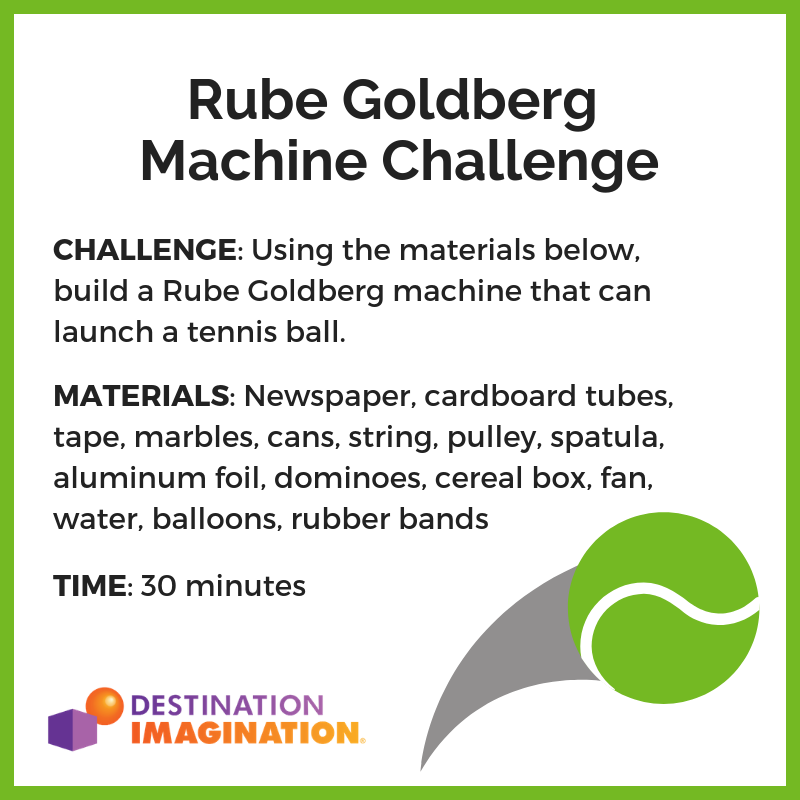 Challenge: Using the materials below, build a Rube Goldberg machine that can launch a tennis ball. Materials: Newspaper, cardboard tubes, tape, marbles, cans (e.g., a soup can), string, pulley, spatula, aluminum foil, dominoes, cereal box, fan, water, balloons, rubber bands. How did you work together as a team to complete the Challenge? What didn’t work? How could you fix it so that it worked? What other materials would you have liked to use? Instead of launching a tennis ball, what other types of actions would you want your Rube Goldberg device to complete?